You might think that Playmakers sounds only vaguely Bluegrass related, but this year the names Mike Compton and Steven Gilchrist were on the list of presenters. Most Bluegrass mandolin players would crawl over broken glass to hear and see these guys playing and talking about mandolins. Luckily, all I had to do was drive 400 klms and drink complimentary wine at the opening. There were a number of interesting workshops. Scott Wise’s Uke session challenged all of my prejudices about the much misunderstood uke. 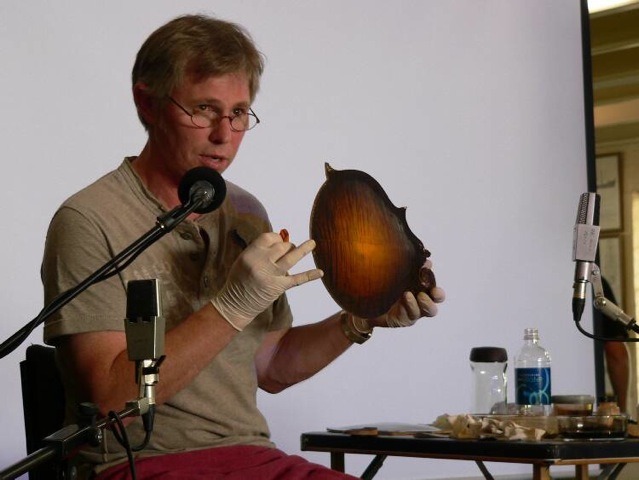 Paul Duff put a sunburst stain on a mandolin back, live. I don’t know if it will make good radio, most of the sessions were recorded by ABC National for Robyn Johnson’s Into The Music programme, but it was a lot of fun to watch and Paul’s commentary was very informing. 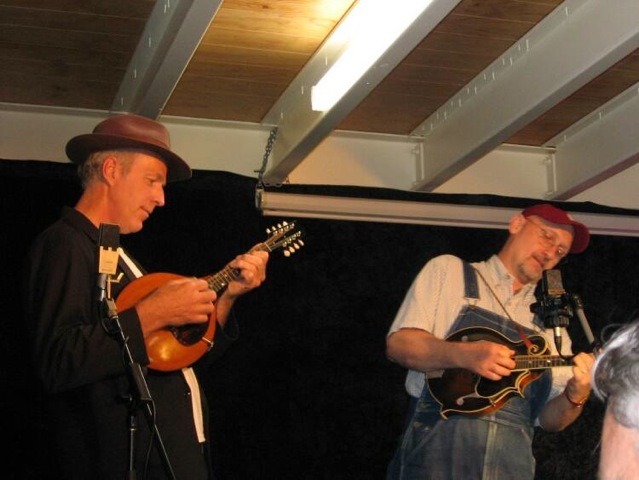 Mike Compton and Steven Gilchrist presented a workshop about the creation, fall, exile in the wilderness and ultimate rise of the F5 mandolin, with asides about Lloyd Lore, Bill Monroe and others. Linking all this together, and thrilling the 80 or so people present were a lot of really good songs and tunes. The chemistry between these two is magical. Most of the workshop presenters also participated in the Saturday night concert. Compton and Gilchrist opened with a great set, Scott Wise played four different instruments, all of which he had built himself. Then there was a curious inclusion in the form of a guy who presented a composition, constructed from recordings of people cutting, scraping and tapping pieces of wood. This presentation got a mixed reception, but did provoke a lot of comment such as “Nothing can touch the cutting tone of a ’37 Stanley backsaw and I think the PA is getting a bit scratchy, but mostly, “What was that about?” I guess some people enjoyed it. The curmudgeons in the audience, your correspondent not least among them, were placated by a final set featuring Bluegrass Parkway aided and abetted by Mike Compton. The small stage caused some unusual traffic snarls as musicians tried to get up to the microphone for their breaks. This, combined with the usual BGP intra-band sledging made for a lot of fun. Sunday featured a Q & A for luthiers conducted by Scott Wise and Paul Duff and a final wind-down concert. I had to miss the concert – remember the 400 km drive? Well that had to be done in the reverse direction and we elected to do it before the ‘roos came out to play. It was a great weekend. 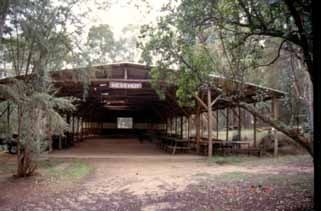 Submitted by Ed Lowe for the Australian Bluegrass Blog. Anzac Day weekend 2008, will see host of bluegrass fans and musicians gather for the annual Ausgrass Festival in Tumut, New South Wales. Ausgrass 2008 will be hosted as part of Tumut’s ‘Festival of the Falling Leaf’. Festival organizer Howard Miller states: “that accommodation in the town is at a premium, the festival event is well attended each year, so it is essential that anyone who wants to go, book SOON or sleeps in the park on a bench”. 5:oopm – 7:00pm – Open mic blackboard concert. 9:30pm – late – Jamming. 8:oopm – 10:30pm – Grand Ol’ Oprey Show, Montreal Theatre. 10:00am – 4:00pm – Busking Competition and Jamming downtown in Adelong.